I was hanging out at the mall with my BFF after brunch and we went into Sephora. I had no intention of buying anything. LOL But who can resist Sephora? I can't! I had browsed the Sephora Smokey Eye Palettes online a while back. I thought they were cute and I liked the colours offered but not for the price. When we were in the store they were marked WAY down to $13 CDN ($10US). Well I thought that was a very good deal. In my basket they go. On the way to check out, I grabbed the MakeUp Forever HD powder ($17CDN) and two $1 Sephora jumbo eye pencils (blue and purple) from the sample racks that line the check out line. I can never resist those racks. I also cashed in 100 points and got the sample sized MUFE Aqua eyes pencil in Black. Plus they gave me a free Bare Minerals Original sample pack. 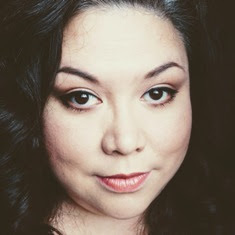 In it is the Bare Minerals powder in Light, Prime Time Foundation Primer and the teeniest little kabuki brush. It so cute. 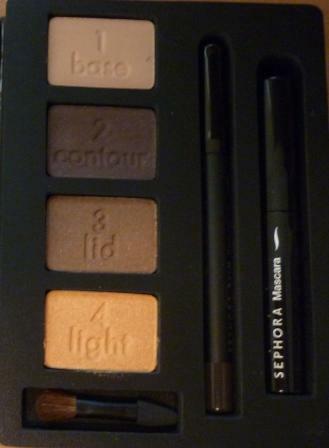 The Sephora palettes are very pretty. The palette are shaped like little books with a magnetic closure and a little strap to make sure it stays closed. 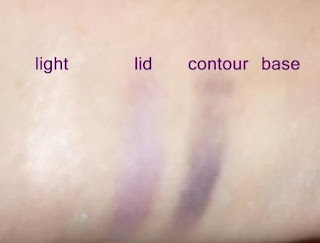 They also have step by step directions for a smokey eye look in each one. I might try this tutorial. Note sure yet LOL. There are more indepth written instruction inside the palette. Each palette has 4 shades that are marked; 1) base 2) countour 3) lid 4) light. 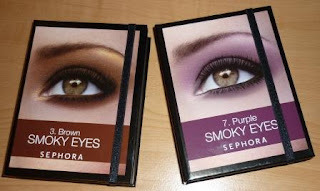 They each have a eyeliner, Black in the purple kit and Brown in the brown kit as well as black mascara. 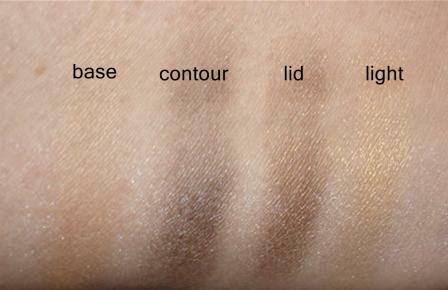 When I swatched the eyeshadow I found them to be nicely pigmented and kinda creamy. So far so good.... I can't wait to wear them out! 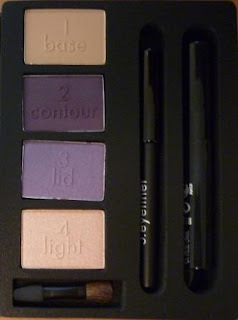 Anyhooo, here is what the palettes look like inside and some swatches. I messed up this pic, sorry! What did my BFF buy? 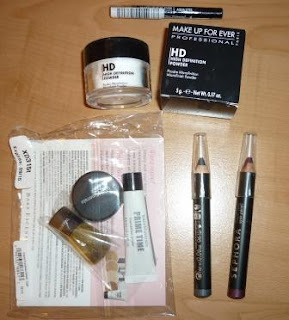 She got a poop load of Benefits products; the new mascara, the lip tints (which she loves now) and the primer/concealer sample package and the got a free Benefit tote. Another one hooked on Sephora!